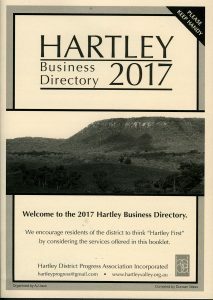 Every March the Hartley District Progress Association produces a local business directory. This hard copy directory is distributed to over 700 households in the Hartley District. A summarised listing of businesses also appears in each quarterly newsletter. We also list your business in our online business directory. This allows you to give many more details about your business, include photos and really let us know what you do. The price for a year for all three forms of advertising depends on the size of your ad in the hard copy directory. If you miss out on the hard copy directory, or start your business mid year, you can still advertise in the newsletter and online for $60, pro-rated on the number on newsletters it will appear in. If you offer a free service, eg as a Justice of the Peace, advertising is free.